Registration for the Shamrock Stroll is open! Take part in a world class .5K road race that starts at the Board of Education building and finishes at S. Main and Spring streets. That’s right. We are running this short course, because any further is just too far! 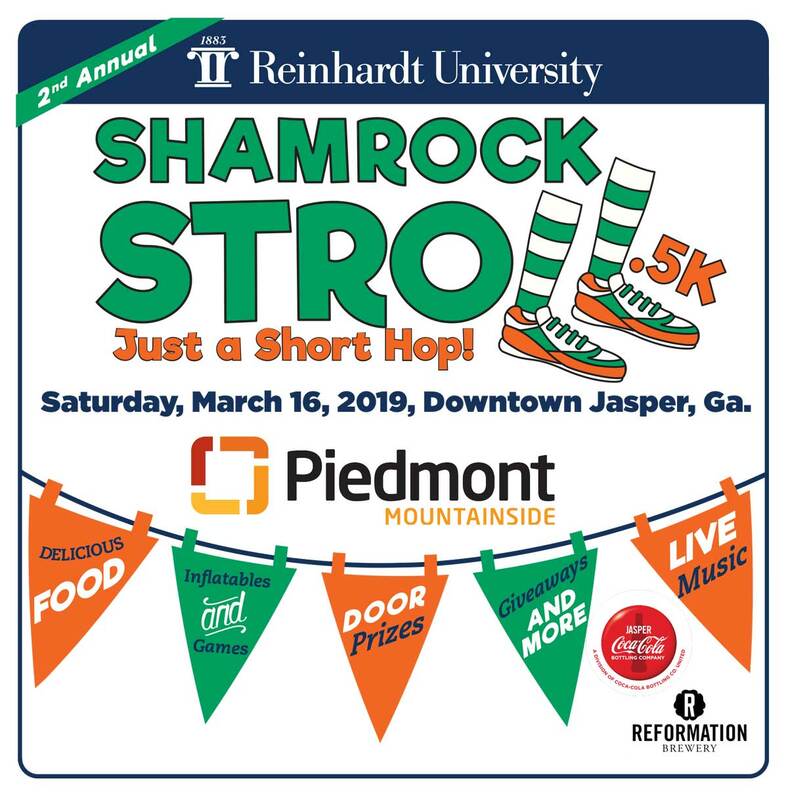 Don’t worry, you will be able to show everyone what a great athlete you are when you put that Shamrock Stroll PRU (Pickens Reinhardt University) .5K sticker on your car. Yeah, you’re that awesome! All proceeds from the PRU.5K will support Pickens County students attending Reinhardt University. There’s More at the Post Race Party! The Shamrock Stroll PRU.5K will include a post-race party that includes fun activities for the whole family. Live music will keep runners moving and grooving. Coca Cola and Reformation brews will address any rehydration issues. A variety of food trucks will be serving up food, including 61 Main restaurant which will have a traditional St. Patrick’s Day meal to-go. Race Day Registration begins at 4 p.m.
.5K begins at 5 p.m.
Fee includes one beverage ticket, T-shirt, medal and race bib. Friday, March 15 from 2-5 p.m.